A girl loses her face in an accident and her father tries to make skin grafts by getting some face donors. Face donors aren't too chuffed about it. Some times genres take a step forward with a new film. Well with Yeux Sans Visage the horror genre is catapulted forward into a world of blood, gore and medical horror without precedent in cinema. Jumping from the moderate blood of the hammer Dracula to cutting the face off a person all on screen is pretty drastic. But this is not all! It is a great, quality film. Beautiful and horrifying at the same time this is not done for cheap thrills. The film feels quite retro in fact, if it weren't for the graphic moments, like a mix of 30s Universal, German Expressionism and Jean Cocteau Fabulism, it draws from all the best sources to be unnerving and pretty cool. Although it passed through the European censors, the film caused controversy on its release in Europe. The French news magazine L'Express noted the audience "dropped like flies" during the heterografting scene. During the film's showing at the 1960 Edinburgh Film Festival, seven audience members fainted, to which director Franju responded, "Now I know why Scotsmen wear skirts." For the American début in 1962, the film was released in an edited form. It was given an English-language dub, and re-titled The Horror Chamber of Dr. Faustus. Edits in the Dr. Faustus version removed parts of the heterografting scene as well as scenes showing Doctor Génessier's more human side such his loving care for a small child at his clinic. The distributors recognized the artistic intent of the film and played up that element in promotion with an advertisement quoting the London Observer's positive statements about the film and noting its showing at the Edinburgh Film Festival. This is in contrast to presentation of the secondary feature, The Manster (1962), which mainly focused on the carnie-show aspect with its "two-headed monster" and "Invasion from outer space by two-headed creature killer". 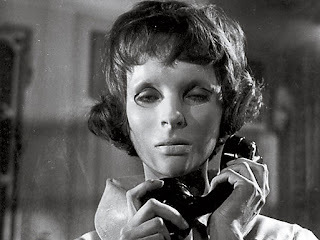 Eyes Without a Face had a very limited initial run and there was little reception from the American mainstream press. Eyes Without a Face received its second large theatrical release in a September 1986 re-release of the film (in conjunction with retrospectives at the National Film Theatre in London and at film archive Cinémathèque Française for its 50th anniversary in France. As a founder of Cinémathèque Française, the archive celebrated Franju by presenting the director's back catalogue. The film was re-released in its original form to American theatres on October 31, 2003 under its original running time and title. American trailer for the double bill with THE MANSTER!